Sheep Camp along Summit Creek on the TYT. Pad backrest, journal, stove, leg-rest all surround my seat. Finally we'll get out into the field to work out how our body and gear work in nature. Is your first consideration, not mine. Is your budget an issue? Do you have a propensity to get very cold? Do you have any particular physical issues & injuries that must be considered? You must consider all of the issues that define your personal backpacking gear and training needs. To become a Long Distance High Sierra Backpacker. This involves evolving the fitness, skills, and gear necessary. Let's do this. 1st> Start Walking. Find stairs. Jog. Put yourself in motion. 2nd> Plan gear purchases. Study gear. Outfit a car camping setup with gear suitable for backpacking. Start collecting the pack, stove, tent, sleeping bag, and other bits of gear you will need. 3rd> Evolve extensive day hiking into car camping as a prelude to our first overnight backpacking trip. We will evaluate the effectiveness of our gear, clothing, and fitness on overnight car camping trips. Adjust gear as necessary. Look internally at your fitness and skills and externally at the rigors from sky and mountain. We must balance our fitness and skills against the rigors of Nature. 4th> Lengthen our next trip a bit. Get Stronger. Get familiar with your gear. Observe how nature and you work together. The Best way to get started is to determine your personal propensities a little bit at a time. Are you fit, healthy, experienced, and geared up? Then hit the long trail. If we are not fit, we will still hit the trail! Just not the long trail. We'll start with local walks, buy a set of light boots, get a little day pack, and start day hiking. Figure out our current capacities. Do you run hot or cold? Do you use a lot of water or a little? Have good endurance or none at all? Answer all of these questions in the field during an expanding programs of walks slowly morphing into walks with short segments of jogging. The more we pursue these questions, the fitter, healthier, and better geared we become. After a bit of walking and dayhikng we will begin jogging longer and longer parts of our "walks." At the same time we will start searching for great deals on a backpacker's tent, sleeping bag, and food kit. As we collect the necessary gear we will drive it out to our local forests and parks for some car camping and day hiking. With boots, gear, and some car camping gear testing and familiarity under our belt we'll be ready to find a nice pack and think about hitting the trail for our first overnight backpacking trip. Your gear kit is 1/3 of what externally defines you as a backpacker. One look at a person's gear kit, their gait, and the look in their eyes reveals almost everything about a backpacker's perspective on the wilderness, their physical condition, and their motivations. You should look at building your kit as an expression of your personality, your physical capabilities, and your values as a person. These elements determine what gear selections best address each person's capabilities and character. Though these principals guide our approach to selecting gear, only the very real physical requirements of the High Sierras prove our gear selections correct, only field-testing proves our fundamental assumptions are indeed facts. In other words, we've really gotta watch out for any unrealistic, even idealistic, assumptions we may have about what nature can do or about our capacities to endure. We must factually determine our capacities to withstand fatigue and cold, realistically gage the range of cold and fatigue we can potentially experience on our trip, and offset the potential for harsh weather with adequate gear for our personal level of cold resistance. Finally, we must have the experience to properly deploy it. Bad assumptions about our own personal capacities and the gear we need to protect ourselves from physical and environmental dangers in the Sierra produce matching bad outcomes. Backpacker's food and gear loading distributes itself along what I call the, "Goldilocks Curve." Backpackers either carry too little, just right, or too much food & gear. One path to failure is represented by ultralight backpackers who believe that their insufficient shelter, their too-thin of sleeping bag, their too light layering, and their thin footwear are sufficient for the weather extremes the High Sierras are capable of instantly producing. Some of these folks approach simplicity like a religion. Unless you've years of experience backing up your assertions, I'm very very skeptical. A few days of fierce early-Summer cold rains and snow routinely threatens the lives of dozens of under-prepared PCT hikers who enter the South Sierra as early as they can every year. This same light gear setup would be much safer, if still unwise, a month later in the season. These same late-Spring and early-Summer storms that literally threaten the lives of lightly-geared PCT hikers provide well-prepared backpackers with exhilarating opportunities to exercise their skills and gear. Responsible backpackers show themselves through trips geared for the range of possible weather their trip entails, assuring that both their physical capabilities and gear are sufficient for worst-case weather scenarios, not just optimal conditions. These assurances come through a logical evolution of fitness and experience. At the other end of the spectrum are those who pack too heavy. I have seen too many backpackers pack everything and the kitchen sink who critically over burden themselves. My favorites were the bunch of country dudes who carried cast iron skillets, axes, and a cut-down full-sized shovel onto a long trip along the John Muir Trail. Really. They made the best out of the situation by using the shovel to bury the skillets and axes, as per my brilliant suggestion. Pack lightened! I still laugh when I think about those guys... "you brought the solution to your own problem...use the shovel to bury the skillets and axes..." I am still laughing now as then. The heavy over- packers suffer from the constant pains of a too heavy pack. Exhaustion is also a serious threat in the back country, especially at high altitude. Insufficiently geared backpackers are at the mercy of the weather. Don't fail due to internal miscalculations about your level of fitness or because of external miscalculations about your insulation and shelter needs. Backpackers die when their physical miscalculation about their gear needs lines up with the appearance of a cold Summer storm, just when their miscalculation about the physical demands of the trail are inducing exhaustion. Practicality is the watchword for well-constructed kits. Not too much, and not too little. In my case that also requires serious practical budget considerations. Money equals weight in the backpacking world. Budget considerations cannot in any way compromise my security in the High Sierras during any season. If I don't have the right gear, I don't go. But I'm a lucky backpacking bum. Let's put together a backpacker bum's kit. This site's goal for novice backpackers is to bring you from the couch to the crest. Specifically, to get you on the Sierra Nevada Crest hiking one of the classic long trails between Lake Tahoe and Mount Whitney, if not the TW itself. Assess your level of fitness, your injury history, and the selection of gear you have at your disposal. This assessment will determine the start point of your hunt for gear and the fitness and experience to properly put them all together on High Sierra trails. As I suggest above, non-hikers should set a goal and have a pragmatic plan to achieve fitness. My goal is to gradually get you ready for the hike from Tahoe to Whitney in a logical evolution of fitness, skills, gear and experience. Every time I break something on my body or in my gear kit, I have a process to remedy the loss. Sometimes this process is like starting backpacking from less than scratch, other times it is just getting started again after a minor injury and the associated sedentary period. Physically, you must first recover from the healing phase of the initial injury and be ready for rehabilitation, otherwise known as training. We used to call it work. You must be willing to work. Start with light stretching, light weight-lifting, and short local walks. Carefully monitor the response of the injury. Back off with inflammation and pain, increase work with successful completion of your current level of training. I consider myself totally prepped when I can easily jog 7 miles with a 750 foot elevation gain. This means I will not suffer too much during the transition to heavy pack and high elevation field conditions. If I can run half that distance I will suffer twice as much for twice as long. Gear acquisition is not much less precise a science. Start studying boots, and when opportunity for a great deal strikes, get some nice light-to-medium boots. Add a small day pack, and begin to collect up the bits of backpacking gear that you can use to support some nice car camping before you hit the trail. Once you get your stove, tent, sleeping gear and some good backpacking clothes lined up you can familiarize yourself with using them and test their suitability in a controlled car-camping environment. Gradually bring your hikes to the next level, and launch your day hikes from a free National Forest car camping site along the Sierra Crest. If you are not in proximity to the Sierra Crest, bring yourself to your nearest National Forest location where you can car camp for free. Car camping is free in National Forests, and no permit is required, though you will need a fire permit even for you stove in the High Sierra. Check your local National Forest for information on their car camping opportunities. There are many free car camping sites on all the more remote Northern trans-Sierra Highways. The goal here is to get you fit, get you some basic gear, and get you familiar with how to comfortably deploy and use that gear one logical step at a time. You will sit in your car-camping site and figure out exactly how your layers, your tent, your stove, and sleeping bag are working for you. You will figure out fuel, food, and water usage and you will determine the proper layering to keep yourself warm at night across the range of temps experienced in the High Sierra. Your High Sierra day hiking will improve your fitness, break in your boots, and allow you to explore the local areas where you will execute your first backpacking trips. Oh, and you will watch half of eternity wheel overhead every night, while tracking the routine of daily life in the mountains during the days. After a bit of this day-hiking and car-camping you will put it all on the trail, and know what has already worked for you while car-camping near the Sierra Crest! My goal as a long distance backpacker is to have the capacity to hike all day, from before sunrise to just before sunset, covering a minimum of 15 miles per day for 5 days consecutive days between days off while being well fed, warm, and able to physically recover from one day exertions for the next. I must be able to repeat this output for as long a period of time as necessary to reach the destination. There is a method to this madness. The key section of the PCT-TYT across Emigrant Wilderness and the North Yosemite Backcountry is about 75 miles between resupply points. The key section of the PCT-JMT from Muir Ranch to the Whitney Portal is around 132 miles from end to end. The distance vs. time vs. food/pack weight demands of these two key sections determine that 15 mpd is around the minimal capacity necessary to efficiently cross these distances. If we go slower than 15 mpd the increase in food weight will make the overall pack weight unbearable. Especially for the lengthy Muir to Portal section. Our pack will be noticeably lighter if we can maintain 17 or 20 miles per day. This is very very strenuous work at very high altitude up steep mountain trails carrying potentially very heavy pack loads. Oh, and each of these long sections of trail are the hardest sections of both the North and South Sierra, respectively. This difficulty of the work load should not be underestimated. Our long distance backpacking trips across these lengthy sections between resupply points each takes a considerable number of strenous hiking days to complete. This requires we have training and trail plans that prepares us for crossing long distances unassisted while successfully enduring weeks of physical stress and exposure. This level of fitness will give us the capacity to walk around 75 miles on a five day food load. Reaching this level of capacity will be a very important milestone if we are planning to hike the Tahoe to Yosemite, John Muir, or Pacific Crest Trails. Our gear must serve us well for this to happen. The distance between our last resupply at Muir Ranch and the Whitney Portal is around 132 miles, off the top of my head. Without resupply. That's roughly 15 miles per day over 9 days. Having this level of physical capacity gives us the ability to access any long distance trail in the country. We are fit enough for four-season High Sierra travel, with the addition of the necessary skills. If you have not worked yourself through this process of exploring the limits of your improving fitness while breaking-in a set of boots, of collecting gear and matching gear to your specific needs, of staying warm and (relatively) dry while developing the skill sets necessary to set up your protective tent in high wind and cook a great meal on your little camp stoves in driving rain, you have not yet lived. And you should not plan on walking the PCT until you have, or are perfectly prepped to do all the above. Every year I meet kids with absolutely no backpacking experience trying to hike the PCT. Wow. Just a little common-sense and preparation would have saved these people a whole lot of suffering. Use the Summertime backpacking gear list as a shopping list. The plan is to have your fitness, your camp skills, your familiarity with a local backpacking area and your gear knowledge all come together simultaneously for a wonderful first backpacking experience. This is especially important for kids and first time backpackers. People who have not accustomed themselves to walking with a backpack are going to have a hard time if you just throw them onto High Sierra trails, and this difficulty is only magnified by altitude and inclination. Think of your worse experience in PE or Boot Camp, then think about it at 10,000 feet under a heavy pack. It is pain itself. If you match that pain with exhaustion and with a pair of new boots and matching blisters, you can drive a kid, a rookie backpacker, or yourself off the trail forever. So bring your fitness, your skills, your local knowledge, and your gear all up to speed logically and gradually before subjecting yourself to the rigors of High Sierra Backpacking. If you are already a runner, a bicyclist, or are otherwise aerobically fit, you will not be immune from backpacking-specific stresses and strains, but you will adjust quickly if you transition your fundamental aerobic fitness into backpacking application with logical skill and gear development. For instance, let's look at the most expensive gear of all, Winter Gear. My $230 Zamberlin mountain boots were bought at an REI end-of-season returns sale. When they used to hold those. I had my boot gear kit in the citidiot tennis shoes I was wearing. Finding the Zamberins on sale, I pulled the inserts out of my tennis shoes, popped them into the frkn expensive boots, and Viola!! The boots fit perfectly, and I bought a $230 set of the baddest-assed mountain boots for $32 dollars. 32 bucks! My North Face Mountain Jacket, $270 retail, was purchased for $99 as a return from the Berkeley North Face Outlet. I did exactly the same thing with my Winter Mountain Pants. It took me a long time to find the right gear. But this should not be a worry. Sometimes it takes as long to to build the skills and experience required to use the gear properly as it does to find the high quality gear you need on the cheap. Don't short yourself on either side of this equation. If you're rolling in bucks, don't let your desires overwhelm you capacities. Don't buy what you don't need or can't use. My philosophy, and yours too, should require that we be personally responsible for always having sufficient shelter, proper insulation, safe water, and copious amounts of good food for the wide range of conditions we can possibly encounter. We must be responsible for developing the fitness necessary to carry this load over long distances in all conditions. We are personally responsible for having developed the skills and experience necessary to be able to effectively deploy and use these resources in all the conditions we put ourselves into. And, we must be able to provide those resources to a downed backpacker in emergency situations. Some folks take quite a different approach, failing to provide for even their own basic needs. I watch people crash and burn on the long trails every year. And I watch people evolve to find their potential on the long trails. Properly evaluating your fitness and skills against your objectives allows you to bring all three into parity. Never carry too much, never carry too little. Don't bite off more than you can chew and keep your objectives within your capacities. Check out the following gear sections for more information. 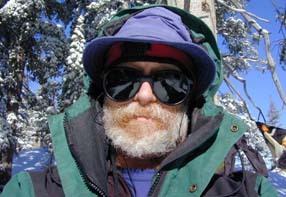 About me: Alex Wierbinski, backpacking bum, age 57, Berkeley California. I remember getting my first backpack in 1966 or so, it was an old school wood and canvas job. I was a Cub Scout. I remember the poncho and peacoat phase, and the invention of gortex. I was not real impressed with synthetics. Later, in the early '70's I got my first alum camp trails pack frame, which lasted me 21 years. The airlines broke the frame on the way to hike the NaPali coast of Kauai in the early '90s. I buy the best gear that does the job that I can afford. Good sources of affordable gear are the North Face Outlet store, and the REI returns sales, where you can get top quality used gear for low prices. I customize, maintain, repair and replace my gear as necessary. Internally, a drug taken to treat my bad knee disturbed my heart rhythm. The disturbed heart rhythm induced a cold weather injury while still undiagnosed. The cold weather injury instability led to a broken leg. Externally, I have no Winter pack (replaced), and my Summer pack is hurting (fixed), the source of my energy, my heart, is misfiring, and the leg with the bad knee is now matched with a leg broken at the ankle joint. Internally, I am learning to perform within bizarre cardiac limits. I did the unmaintained segment of the TYT through Summit City Canyon with this bad heart. I had a very slow pace, but my route-finding skills eliminated a huge amount of potential work rookies often perform. I am working diligently to rehab both the broken lower leg, reanimate my frost-damaged foot, and find a level of cardiac performance that can support long-distance High Sierra backpacking. I feel as if I am juggling at the Gates of Doom. These goals require a careful application of increasing range of motion, strengthening, and endurance work coupled with careful observation of the effects of work on the damaged parts. The inflammation and pain of rehabilitation must be controlled by never overworking our damaged parts, or otherwise risking reinjury. We must carefully find and expand our limits. Consult your doctor and/or rehabilitation specialists before beginning any training or recovery programs. I figure that during the next three years I will probe and discover the limits of restoring my cardiac and physical potentials step by careful step. The cycle is the same no matter what level of fitness we start from: training is work, pain, rest and recovery repeated endlessly. What changes is the output and level of performance for a given unit of pain. When injured our physical output for a given amount of pain is minimal. When in top shape our physical output for unit of pain experienced is maximal. I built my gear kit as I built my skills and guide my injury recovery: one step at a time from the basics. I began my adult backpacking life day hiking into the Sierra during Winter, probing Christmas (Long) Valley with exciting day hikes in the late 1980's and early '90's, after a friend moved up to Meyers in the South Lake Tahoe Basin. I was hooked. These experiences drew me into backpacking the Sierra Nevada during Summertime with the clear goal to get in during Winter ASAP. Back then the Sierra was a Winter Wonderland, and would occasionally turn into a Crystal Wonderland. I started with the same basic wool insulation and shell layers that I had last used as a Boy Scout backpacker in the early 1970s. This gear is still sufficient for Summer Backpacking, but is very heavy! I began Summertime backpacking in the Sierra with the goal of acquiring Winter gear and snow backpacking skills. I soon began Spring and Fall snow trips, and pushed in during mid Winter after gaining a couple of years of experience in the milder conditions of Spring and Fall. These experiences affected how I judge gear. As it is a given that a Winter pack is heavy, and travel in snow is difficult, I soon considered Summer trips as good training and scouting for Winter travel. Thus I have regularly carried Summer packs in excess of 60lbs, and sought out cross country and scrambling routes. The capacity to carry heavy loads while route finding is helpful for carrying "trail guide writer" gear, to not get lost or damaged during Winter backpacking, and allows extended Summertime adventures. On August 28, 2009, I exited the Whitney Portal ending my 4th complete Lake Tahoe to Mount Whitney trip. There's a hang scale on the wood structure marking the Whitney Portal Trailhead. My pack weighed 37 lbs with not a bit of food in it. After returning to the Bay Area and not enjoying "civilization" for a couple of weeks after finishing my TW backpacking trip, I packed two weeks of food into my already heavy pack and walked from Meeks Bay to Tuolumne Meadows along the TYT. I enjoyed civilization more after that hike beat the heck out of me! Your gear is everything you bring into the mountains. Without Gear you would be Naked in the Mountains. With bad or mis-selected gear, you might as well be naked. Your Gear choices define your knowledge of the wilderness, how you view the power of nature, and will be highly predictive of the outcomes of your backpacking experiences over time and changing conditions. I started backpacking with wood, wool, and plastic and did just fine. Now we have aluminum, gor-tex, and titanium. Today's heavyweight pack is yesterday's ultralight. Thank god. I'm getting old. Don't be afraid to take what you need. You can take it, if you have properly prepared yourself. If taking what you need over-strains you, you must become fitter before undertaking the High Sierras. Gear selection sets the tone of your backpacking trip. If you are too heavily laden for your planned mileage, just plain over packed or too weak, you will be painfully slow and will struggle trying to make the high daily mileage long distance backpackers are required to cover. If you are properly packed you will have a much better chance of making your daily miles, even when the High Sierras throw down a week of snow, five days of freezing rains, and a couple of weeks of afternoon downpours during your trip. I have experienced all of these conditions during the course of one High Sierra Summer. Rather than being a danger, these conditions were delights. Packing light has its advantages, and must always be a consideration in gear selection. We will reduce the strain on the body and therefore we will make more miles per day, or make our daily miles easier. This translates into less food needed for a given distance. Lightening our gear and food load may allow us to get away with lighter boots. Light makes lighter! But this desire for ultralight loading is routinely taken too far. In the pursuit of lightness far too many Pacific Crest, High Sierra, John Muir, and many other long-distance backpackers are not properly equipping themselves for the range of weather and terrain they will encounter in the High Sierras. Though you specifically may get through while under equipped, the significant percentage of under equipped PCT and JMT who hit the trail every year assures that the rate of rescues and the occasional fatalities we currently experience will continue. Don't gamble with your safety and comfort. Pack the lightest pack you possibly can by all reasonable measures of safety possible, but do not sacrifice safety for lightness, as I see all too often. One recipe for disaster in early or late Summer is the gear combination of sandals or light tennis shoes, a tarp (rather than a tent), poor upper and lower body insulation, and a lightweight 40° bag. Hell, our pack only weighs 20 lbs with this gear set-up, but when a three-day snowstorm rolls in (and one will, eventually), we are either capable of getting out of the mountains immediately, or we may die. We certainly will suffer terribly. We must be aware of the range of weather threats we potentially face, and carry the gear necessary to cope with the worse Nature can throw down. Too light-weight of gear is also prone to easily damage, and therefore does not go off-trail well, and it certainly does not last very long in any case. Because scrambling durability, surviving falls, and budget are all serious considerations in my gear set-up and selection much ultra light gear just does not make the grade due to its fundamental lack of durability. A member of TW is starting a custom lightweight backpack manufacturing company. They look really good. I almost always pack an extra day's food between each resupply point backpacking between Lake Tahoe and Mount Whitney to take a day or two to scramble and explore. I routinely hike non-maintained "trails." I would not take most lightweight packs into these environments. Their light fabrics would be torn apart. Hell, I get torn up! I prefer not to use "throw-away" anything, especially when it comes to my gear. to my feet in camp and at resupply spots. I was told by many Pacific Crest Trail 'ers last Summer (2009), as I walked South from Lake Tahoe to Mount Whitney, that an early season Pacific Crest Trail hiker had to be emergency rescued from South of Forrester this year (2009) because she did not bring the gear to survive an early season snowstorm. The trail story was fundamentally correct, and not very rare. I see dozens of unprepared backpackers driven off the Sierra Crest by weather, fatigue, and lack of physical preparation every year, many a few short steps away from disaster. But it gets even worst: She initiated, but did not call off, the rescue when she walked out! NEVER make these STUPID mistakes. ALWAYS bring the gear for the range of weather you may experience in the High Sierras. Do not venture into potentially extreme circumstances until you have developed the experience to USE that gear properly in extreme circumstances. If you can and do call in rescue you must make contact with a Ranger or SAR folks ASAP upon reaching safety to confirm the end of your danger. The High Sierras can be a harsh mistress, even during Summertime, and yet it is most beautiful in its extremes. If you are properly prepared you will still suffer a bit to experience the beauty. Temperatures can drop radically, and the unprepared can be put into mortal danger. Don't become an example of self-delusional stupidity in the High Sierras. Nature does not operate by your understanding of it. You do. If you misanalyize yourself, or your environment, you will certainly suffer, and you may die. On the positive side, we were made to operate and navigate in all environments, in all weather conditions, while traveling under heavy load while chasing or being chased. You just have to pick up and develop these internal and external skills and capacities before throwing yourself into Nature's "Deep End." If that's what you are looking to do, to throw yourself into nature as logically and safely as possible, then this site was made for you. I employ a seasonal, as well as a trip by trip approach to base-layering. I carefully choose the proper base layer, insulation layers, and shell layer for the season and the range of wilderness weather I can possibly encounter. The goal is to remain warm while backpacking and when stationary in camp. In camp during the night we should be able to stay warm and dry wearing all our layers in our sleeping bag inside our tent during the worst weather the season can throw down. For example, my Spring and Fall gear kits are composed of my Summer gear combined with the additional insulation required to deal with the declining temperatures and increased storm activity during Spring and Fall. On the other hand, my Winter gear kit completely replaces many of the lighter elements of the Summer-Spring-Fall kit with much heavier gear appropriate for Winter in the High Sierras. These replacements include a heavy outer shell, heavy boots, and thick gloves. Above: Heavy Winter Gear. Visible: Heavy outer shell, fleece coat, long sleeve light weight polyester. Ear warmer band, sunhat, fine REI sunglasses. Not seen: Wearing polyester thin tank top. Two insulation layers still in pack: Medium weight poly upper, down coat. Our base layer is the layer that sits next to our skin. This is the layer that we will wear for the duration of our trip. Our base layer must reflect the fundamental degree of insulation we require for daily travel through the terrain. Our base layer is our fundamental protection against the elements, and must accurately reflect the conditions we will experience. The standard role of our base layer is to keep us in the comfort zone while under a full backpacking work load. During Summer, late Spring, and early Fall my base layer is a pair of nylon zip to shorts pants, and a thin polyester tank top. This thin base layer reflects the huge amount of heat that we generate carrying pack in the Sierras. This base layer can be instantly supplemented by the required additional layers: if the temps drop or the winds pick up the long-sleeved poly is instantly applied. Rain brings out the shell. Layers are added to or removed from the base layer as necessary. During late Fall and early Spring I begin employing a thin polyester thermal base layer on both upper and lower body. If the conditions are really cold, I supplement that with a second medium weight polyester layer. These are the layers that I plan on hiking in, so if I over-layer, I will have to strip a layer off to avoid sweating out during exertion. Note that your base layer is NOT designed to keep us warm when stopped, only to keep us comfortable while hiking, while generating heat. When we stop, make camp or lunch, we will have to immediately employ the proper layering for the conditions. Our insulation layers sits between our base layer and our shell, and are only deployed as necessary. Our insulation layers must reflect the degree of insulation we will require at our coldest while generating no work heat. This would be while sitting in camp at night during the worst conditions the Sierras can throw at us. In Summer time, my lower body insulation layers consist of one additional layer above my zip to shorts pants: Medium weight fleece pants. Our shell is our external wind and water proof layer. During Summer an ultralight approach is sufficient for both upper and lowers, but medium weight may be substituted. During Winter I highly recommend heavy-weight uppers and lowers. A degree of insulation in the shell is nice in especially cold conditions. Serious high winds at low temps cut right through light and medium shells. Never rely on light weight gear in mid-Winter in the High Sierras. There is a point in each snowy Spring when the temps rise, and the Winter shell can begin to be replaced with the lighter-weight gear. The same is true with the onset of Fall. A light shell can be run deep into Fall, until that point in time when the temps drop, and heavier Winter gear becomes mandatory. If you are unsure about seasonal change in the Sierras, always bring the heavier gear. Have a great Sierra Nevada route or trip to relate?